Case of twelve 12 oz. 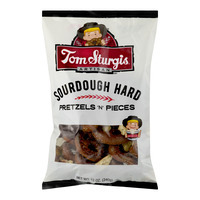 bags of Sourdough Hard Pretzels N' Pieces, certified OU-D. Sorry, no foreign or expedited shipment on bulk cases. THESE PRETZELS ARE VERY HARD. DUE TO THEIR CONSISTENCY, THESE PRETZELS WILL BREAK DURING SHIPMENT.